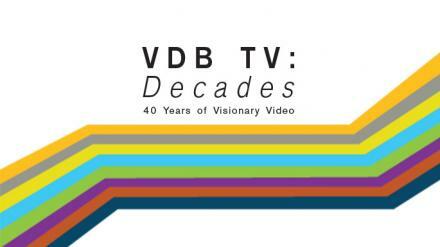 VDB TV: Decades is a unique series that casts a distinctive eye over the development of video as an art form from the early 1970s to the present, produced to mark the 40th anniversary of the Video Data Bank. Each program in this five-disc box set was curated by an inspiring artist, scholar, or media arts specialist focusing on a specific decade. Programmers surveyed the VDB collection to create personal, distinctive, and relevant programs, accompanied by original essays and texts, available as ROM content on each program disc. VDB TV: Decades is the perfect accompaniment to VDB’s iconic anthology Surveying the First Decade: Video Art and Alternative Media in the U.S. 1968-80, providing another essential tool for understanding the development of video and media art over the past five decades. Basma Alsharif, Souheil Bachar, John Baldessari, Rosa Barba, Liza Beár, Lynda Benglis, Sadie Benning, Dara Birnbaum, Paul Chan, Cecelia Condit, Ximena Cuevas, Simone Forti, Leah Gilliam, Gran Fury, Nancy Holt, Doug Ischar, Tom Kalin, Paul Kos, Marlene Kos, Barbara Aronofsky Latham, Jesse McLean, Susan Mogul, Tony Oursler, Nicolas Provost, Walid Raad, Steve Reinke, Tom Rubnitz, Suzie Silver, Keith Sonnier, Martine Syms, William Wegman, Matt Wolf, Akram Zaatari, Julie Zando. VDB TV: Decades1980s: Problematizing Pleasure / Punk Theory An original program for VDB TV: Decades curated by Steve Reinke. VDB TV: Decades, The 2000s An original program for VDB TV: Decades curated by Aily Nash. VDB TV: Decades2010s: Future-Past-Present An original program for VDB TV: Decades curated by Omar Kholeif.